Seungsahn Haengwon (Hangul: 숭산행원대선사; Hanja: 崇山行願大禪師; RR: Sungsan Haeng'weon Daeseonsa, August 1, 1927 – November 30, 2004), born Duk-In Lee, was a Korean Seon master of the Jogye Order and founder of the international Kwan Um School of Zen. He was the seventy-eighth Patriarch in his lineage. As one of the early Korean Zen masters to settle in the United States, he opened many temples and practice groups across the globe. He was known for his charismatic style and direct presentation of Zen, which was well tailored for the Western audience. Known by students for his many correspondences with them through letters, his utilization of dharma combat and expressions such as "only don't know" or "only go straight" in teachings, he was conferred the honorific title of Dae Jong Sa in June 2004 by the Jogye Order for a lifetime of achievements. Considered the highest honor to have bestowed upon one in the order, the title translates "Great Lineage Master" and was bestowed for his establishment of the World Wide Kwan Um School of Zen. He died in November that year at Hwagaesa in Seoul, South Korea, at age 77. Seung Sahn was born in 1927 as Duk-In Lee (modern romanisation: Yi Deog'in) in Sunchon (순천), South Pyongan Province of occupied Korea (now North Korea) to Presbyterian parents. In 1944, he joined an underground resistance movement in response to the ongoing occupation of Korea by the Empire of Japan. He was captured by Japanese police shortly after, avoided a death sentence, and spent time in prison. Upon his release, he studied Western philosophy at Dongguk University. One day, a monk friend of his lent him a copy of the Diamond Sutra. While reading the text, he became inspired to ordain as a monk and left school, receiving the prātimokṣa precepts in 1948. Seung Sahn then performed a one-hundred day solitary retreat in the mountains of Korea, living on a diet of pine needles and rain water. It is said he attained enlightenment on this retreat. While seeking out a teacher who could confirm his enlightenment, he found Kobong, who told him to keep a not-knowing mind. In the fall of 1948, Seung Sahn learned dharma combat while sitting a one-hundred day sesshin at Sudeoksa—where he was known to stir up mischief, nearly being expelled from the monastery. After the sesshin was concluded, he received dharma transmission (inka) from two masters, Keumbong and Keum'oh. He then went to see Kobong, who confirmed Seungsahn's enlightenment on January 25, 1949 and gave him dharma transmission as well. Seung Sahn is the only person Kobong gave Dharma transmission to. He spent the next three years in observed silence. Drafted into the Republic of Korea Army in 1953, he served as a army chaplain and then as a captain for almost five years, taking over for Kobong as abbot of Hwagaesa in Seoul, South Korea in 1957. In the next decade, he would go on to found Buddhist temples in Hong Kong and Japan. While in Japan, he was acquainted with the kōan (Korean gong'an) tradition of the Rinzai school of Zen, likely undergoing kōan study with a Rinzai master. Coming to the United States in 1972, he settled in Providence, Rhode Island and worked at a laundromat as a repairman, spending much of his off time improving upon his English. Shortly after arriving, he found his first students at nearby Brown University, most of whom came by way of a recommendation from a professor there. Among these first students was Jacob Perl (Wubong), who helped to found the Providence Zen Center with the others. The Providence Zen Center in Cumberland, Rhode Island. In 1974, Seung Sahn began founding more Zen centers in the United States—his school still yet to be established—beginning with Dharma Zen Center in Los Angeles—a place where laypeople and the ordained could practice and live together. That following year, he went on to found the Chogye International Zen Center of New York City, and then, in 1977, Empty Gate Zen Center. Meanwhile, in 1979, the Providence Zen Center moved from its location in Providence to its current space in Cumberland, Rhode Island. The Kwan Um School of Zen was founded in 1983 and, unlike more traditional practice in Korea, Seungsahn allowed laypersons in the lineage to wear the robes of full monastics. Celibacy was not required and the rituals of the school are unique. Although the Kwan Um School does utilize traditional Seon and Zen rituals, elements of their practice also closely resemble rituals found often in Pure Land Buddhism, Chan Buddhism, and the Huayan school. In 1986, along with a former student and Dharma heir Dae Gak, Seungsahn founded a retreat center and temple in Clay City, Kentucky called Furnace Mountain—the temple name being Kwan Se Um San Ji Sah (or, Perceive World Sound High Ground Temple). The center functions independently of the Kwan Um organization today. Over his tenure as Guiding Teacher, Seungsahn appointed many Dharma heirs. He created the title Ji Do Poep Sa Nim (JDPSN) for those not ready for full dharma transmission but capable of teaching at a higher capacity. In 1977, Seungsahn was hospitalized for cardiac arrhythmia and it was then discovered that he had advanced diabetes. He had been in and out of hospitals for heart complications for years preceding his death, and in 1987 began spending much less time at his residence in the Providence Zen Center. Starting in 1990, and under invitation from Mikhail Gorbachev, Seungsahn began making trips to the Soviet Union to teach. His student, Myong Gong Sunim, later opened a practice center in the country (Novgorod Center of Zen Meditation). Seungsahn implemented the use of simple phraseology to convey his messages, delivered with charisma, which helped make the teachings easier to consume for Western followers. Some of his more frequently employed phrases included "only go straight" or "only don't know". He even went so far as to call his teachings "Don't Know Zen", which was reminiscent of the style of Bodhidharma. Seungsahn used correspondences between him and his students as teaching opportunities. Back-and-forth letters allowed for a kind of dharma combat through the mail and made him more available to the school's students in his absence. This was another example of his skillful implementation of unorthodox teaching methods, adapting to the norms of Western culture and thus making himself more accessible to those he taught. He was a supporter of what he often termed "together action"—encouraging students to make the lineage's centers their home and practice together. 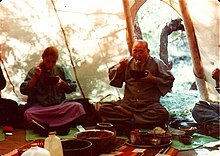 Joan Halifax with Seungsahn at a sesshin at the Ojai Foundation in 1979. Seungsahn also developed his own kōan study program for students of the Kwan Um School, known today as the "Twelve Gates". These twelve kōans are a mixture of ancient cases and cases which he developed. Before receiving inka to teach (in Kwan Um, inka is not synonymous with Dharma transmission), students must complete the Twelve Gates, though often they will complete hundreds more. One of the more well known cases of the Twelve Gates is "Dropping Ashes on the Buddha", the Sixth Gate, which is also the title of one of his books. In the book The Compass of Zen, this kong-an is transcribed as follows: "Somebody comes to the Zen center smoking a cigarette. He blows smoke and drops ashes on the Buddha." Seungsahn then poses the question, "If you are standing there at that time, what can you do?" Not included in this version of the kōan is the Kwan Um School of Zen's following side note on the case, "[H]ere is an important factor in this case that has apparently never been explicitly included in its print versions. Zen Master Seung Sahn has always told his students that the man with the cigarette is also very strong and that he will hit you if he doesn't approve of your response to his actions." When Seungsahn first began teaching in the United States, there was an underemphasis in his message on the significance of zazen. Under advice from some students, however, he soon came to incorporate zazen into the curriculum more frequently. More than a few of his earliest students had practiced Zen previously under the Sōtō priest Shunryū Suzuki, laying out a convincing argument about how zazen and Zen were seen as inseparable in the Western psyche. Throughout the 1990s, Seung Sahn made trips to Israel, which led to the 1999 opening of the Tel Aviv Zen Center. His remaining years were spent in particularly poor health. He had a pacemaker put in his chest in 2000, followed by renal failure in 2002. In June 2004, he was given the honorific title Dae Jong Sa "Great Lineage Master" by the Jogye Order in commemoration of his accomplishments, the highest title the order can grant. Seung Sahn died shortly after on November 30, 2004 at the age of 77 in Seoul, South Korea at Hwagaesa, the first temple where he served as abbot. There is a belief that Seung Sahn made too many students Dharma teachers. He also upset some in the Jogye Order by allowing lay Dharma teachers to wear long robes - while the Korean Jogye Order also gives the title poep sa (Dharma teachers) to laypeople, long robes are reserved for monks in Korea. In the beginning of the Kwan Um School of Zen, people became Dharma Teachers rather quickly, mostly out of need in order to run practice. The current requirement is that a person must take the five precepts after at least four days of retreat, or an agreed upon time by the guiding teacher of a Zen Center. To become a Dharma Teacher in Training will take the individual the minimum of two years after taking the five precepts. This also can only be approved of by the guiding teacher. The student will then take the ten precepts. To become a Dharma Teacher, one must complete a minimum of two years of training as a Dharma Teacher in Training that includes a course of study and certain amount of time attending retreats and serving certain practice roles. It takes a minimum of five years after becoming a Dharma Teacher to become a Senior Dharma Teacher and this must be approved by the guiding teacher. At this time, the person will take the sixteen precepts. Receiving inga (inka) only comes when a student has proven satisfactorily in further training sanctioned by a Zen Master and members of the school. Becoming a Zen Master will require the sanction of several Zen Masters in and outside the school. Seung Sahn was accused of carrying out sexual relationships with students secretly while supposedly celibate. The first accusations of sexual relationships between Seung Sahn and students came about in 1988. Sonia Alexander, former director of Cambridge Zen Center, has claimed that Seung Sahn had carried out long-term sexual relationships with a number of his female followers. Journalist Rick Fields confirms this, writing “the supposedly celibate Korean Zen master Seung Sahn (Seon-sa-nim) revealed long-term relationships with two students.” According to Sonia Alexander, when questioned about the nature of these relationships Seung Sahn stated that "it wasn't [romantic] love, it wasn't lust." These alleged relationships caused Alexander to end her involvement with the Kwan Um School, believing in retrospect that she had been used over the years only to help build more Zen Centers for the lineage. In addition to Alexander, author Sandy Boucher spoke with several other women who lived at the Cambridge Zen Center at the time, one of whom said that in her opinion Sonia was very much in the minority in feeling used and that Seung Sahn's affairs had not been hurtful to the women involved. Notwithstanding her reservations, Alexander still has reverence for Seung Sahn, feels her time spent in the school was to her benefit, and subsequently rejoined the Kwan Um School as a Senior Dharma Teacher in 2011. Zen Master Seung Sahn did publicly admit the nature of the relationships and did two repentance ceremonies. The Kwan Um School of Zen has since developed and enforced an ethics committee that has very strict guidelines for teacher/student relationships and consequences for unethical behavior of any member of the school. The following list documents Seung-Sahn Haeng-Won's transmission lineage, starting with the Buddha and the First Patriarch. Gak, Hyon (2006). Wanting Enlightenment Is a Big Mistake: Teachings of Zen Master Seung Sahn. Shambhala Publications. ISBN 1-59030-340-7. Sahn, Sueng (2003). Zen: The Perfect Companion (Perfect Companions! Series). Black Dog & Leventhal Publishing. ISBN 1-57912-279-5. Seung Sahn; Hyon Gak (1997). The Compass of Zen. Shambhala Publications. ISBN 1-57062-329-5. Sahn, Seung; Hyon Gak (1992). The Whole World Is a Single Flower. C. E. Tuttle Company. ISBN 0-585-06104-1. Sahn, Seung (1987). Ten Gates: The Kong-An Teaching of Zen Master Seung Sahn. Primary Point Press. ISBN 0-942795-01-6. Kwan Um School of Zen (1987). Only Doing It For Sixty Years. Kwan Um School of Zen. OCLC 39712155. Sahn, Seung (1985). Zen Dialogue in China. Hong Bup Won Publishing. Sahn, Seung (1983). Chanting with English Translations and Temple Rules. Kwan Um School of Zen. OCLC 79625070. Sahn, Seung; Stanley Lombardo (1982). Bone of Space: Poems. Four Seasons Foundation. ISBN 0-87704-053-2. Sahn, Seung; David O'Neal (1982). Only Don't Know: Selected Teaching Letters of Zen Master Seung. Primary Point Press. ISBN 0-942795-03-2. Sahn, Seung; Stephen Mitchell (1976). Dropping Ashes on the Buddha. Grove Press. ISBN 0-8021-3052-6. ^ a b c d Ford, James Ishmael (2006). Zen Master Who?. Wisdom Publications. pp. 99, 100, 101. ISBN 0-86171-509-8. ^ Weishaus, Joel. "Paratext". University of Iowa. Archived from the original on February 22, 2007. Retrieved 2008-01-03. ^ a b c d e Prebish, Charles S (1999). Luminous Passage: The Practice and Study of Buddhism in America. University of California Press. pp. 32, 33, 34. ISBN 0-520-21697-0. ^ a b "Coming Empty Handed: Zen Master Seung Sahn in Ann Arbor". Cutting Edge, American Zen Arts Quarterly. Spring 1985. Retrieved 2008-01-03. ^ Sahn, Seung (1992). Hyon Gak (ed.). The Whole World is a Single Flower. Tuttle Publishing. pp. 229–232. ISBN 0-8048-1782-0. ^ Batchelor, Stephen (1994). The Awakening of the West: The Encounter of Buddhism and Western Culture. Parallax Press. p. 222. ISBN 0-938077-69-4. ^ Strecker, Zoe Ayn (2007). Kentucky Off the Beaten Path, 8th edition. Globe Pequot. pp. 106, 107. ISBN 0-7627-4201-1. ^ a b Ho Youn Kwon; Kwang Chung Kim, R. StephenWarner (2001). Korean Americans and Their Religions. Penn State Press. pp. 124, 125. ISBN 0-271-02073-3. ^ Simpkins, C. Alexander; Simpkins, Annellen M. (1999). Simple Zen: A Guide to Living Moment by Moment. Tuttle Publishing. p. 41. ISBN 0-8048-3174-2. ^ Seager, Richard Hughes (2000). Buddhism In America. Columbia University Press. p. 172. ISBN 0-231-10868-0. ^ a b c Prebish, Charles (1998). The Faces of Buddhism. University of California Press. pp. 122, 123, 254, 255. ISBN 0-520-21301-7. ^ Hayes, Richard (1998). Land of No Buddha. Windhorse Publications. ISBN 1-899579-12-5. ^ Sahn, Seung (1997). The Compass of Zen. Shambhala Publications. ISBN 1-57062-329-5. ^ "Seung Sahn's Twelve Gates". Kwan Um School of Zen. Retrieved 2008-01-25. ^ "VirtualTourist.com ceased operations". Members.virtualtourist.com. Retrieved 9 July 2018. ^ "Zen Master Seung Sahn". Kwan Um School of Zen. Retrieved 2008-01-03. ^ Sahn, Seung (1997). The Compass of Zen. Shambhala Publications. p. 391. ISBN 1-57062-329-5. ^ Prebish, Charles S.; Martin Baumann (2002). Westward Dharma: Buddhism Beyond Asia. University of California Press. p. 183. ISBN 0-520-23490-1. ^ a b c d e Boucher, Sandy (1993). Turning the Wheel: American Women Creating the New Buddhism. Beacon Press. p. 226. ISBN 0-8070-7305-9. ^ "GLZC Teachers". "Great Lake Zen Center". Archived from the original on 23 September 2013. Retrieved 18 March 2014. ^ The same basic list is online in English at Kwan Um School of Zen and in Hangŭl (down to the 76th generation) at 조사 (불교). ^ For comparison, see Jinje Seon Sa's lineage chart which is nearly identical with Seung-Sahn's list in The Compass of Zen down to the 75th master, after which the two lineages split up (to 만공월면 / Man-Gong Weol-Myeon in Seung-Sahn's and to 혜월혜명 / Hyewol Hyemyeong in Jinje's). There are five variations between the Seung-Sahn and Jinje lists: the renderings of the 40th, 43rd, 56th, 65th Masters' names, and the Latin spelling of the 58th's. ^ See Thiền Sư Trung Quốc for a list of Chinese Zen Masters in Vietnamese. ^ "Nan-yüan Hui-yü" in The Compass of Zen, and "Nanyuan Daoyong" in Jinje's lineage chart ("Dao" being the third character in the Chinese name). ^ The Wade-Giles "Shou-shan Hsing-nien" in The Compass of Zen, consistent with the Pīnyīn "Shoushan Xingnian" in Jinje's lineage chart. ^ Rendered as "T'ai-tzu Yüan-shan" in The Compass of Zen. ^ Rendered as "Shih-shih Ch'ing-kung" in The Compass of Zen. ^ spelled as "Whan-Am Hon-Su" in The Compass of Zen. ^ Rendered as "Pung-Joung Heon-Shim" in The Compass of Zen.